Preheat the oven to 200°C / Fan 180°C / Gas 6. Cook the asparagus spears in salted boiling water for 2 minutes. Drain, refresh in cold water, then drain again. Set aside. Using a pestle and mortar, crush the mint with the olive oil and lemon zest. Add to the asparagus and stir gently to coat. 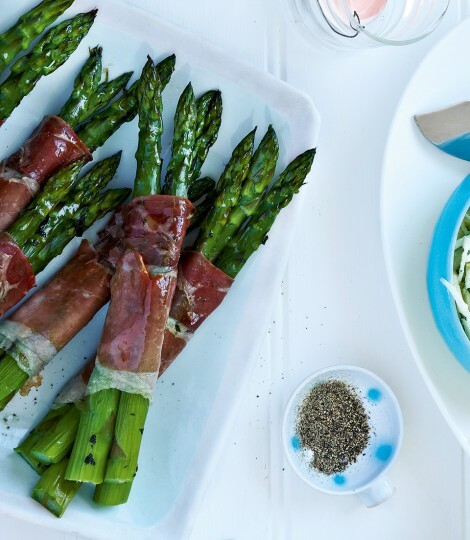 Make bundles of 3 spears and wrap each in a Parma ham slice. Place in a baking tray and bake in the oven for 10 minutes until the ham is crisp.